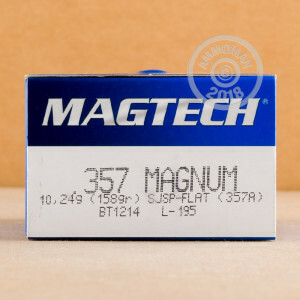 Given its relatively low price, this 357 Magnum cartridge by Magtech is a great solution for any practical application. Looking for an effective load for your self-defense revolver? Considering hoisting a Henry Big Boy while in pursuit of varmints or even a whitetail? Just after a good time at the range? 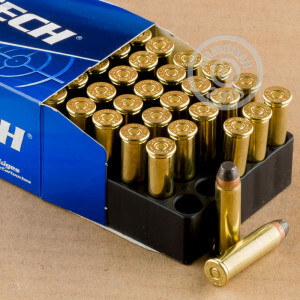 You’ll find this round’s 158 grain semi-jacketed projectile up to the task regardless. This cartridge’s bullet has its core exposed at its tip, so it will deform substantially within soft targets in order to bring them down quickly. The bullet’s tip is flat, so it’s ideal for lever action rifles and delivers superior energy upon impact as well. The partial jacket prevents lead fouling in the bore, and reliably controls just how rapidly the bullet expands during penetration. With so many advantages provided by its bullet you’ll be all set to enjoy these 1,000 rounds however you please. 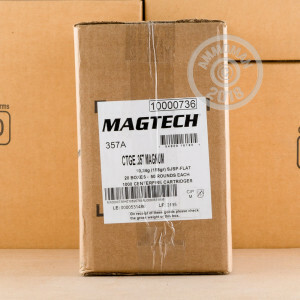 CBC Group is one of the world’s largest ammunition manufacturers, and Magtech is their commercial brand. The CBC Group doesn’t owe their dominance to flashy gimmicks -- it’s their products’ quality that put them on the map. As such you can count on this handy round’s brass casing, non-corrosive Boxer primer, and clean burning propellant to give you great performance no matter the platform you utilize them in.